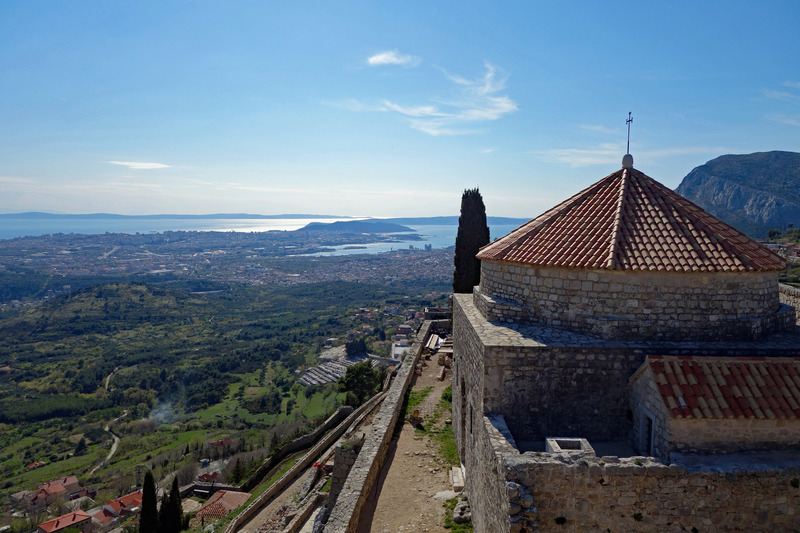 Klis Fortress is a medieval fortress perched on an unscaleable cliff overlooking the city of Split, the Adriatic Sea and surrounding islands. This imposing fortress has a history of more than 2000 years, founded in the 2nd century BC it was conquered and retaken many times. 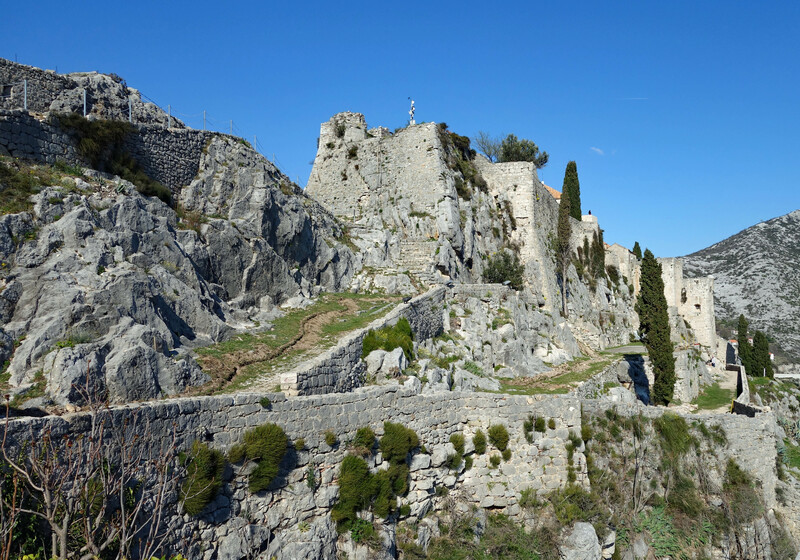 First built and inhabited by the Illyrian tribe it was used as a stronghold before it was taken by the Romans. After the fall of the Roman Empire the site was taken by the Visgoths and in the 7th century became a seat for several Croatian kings, before the Ottoman Turks conquered the fortress. Next, Venice seized the fortress and they were later ousted by the Austrians, it was abandoned as a military outpost in 1867. This fortress has had more owners than you can shake a stick at!!! The admission price was 40 Kuna each (6.15 USD) and gave us access to climb freely around the fortress and visit the small museum, which has displays of swords and costumes and details of the castle’s long and brutal past. We thoroughly enjoyed spending 90 minutes exploring the ruins and marveling at the 360 degree views. Being here in off season, we pretty much had the place to ourselves. 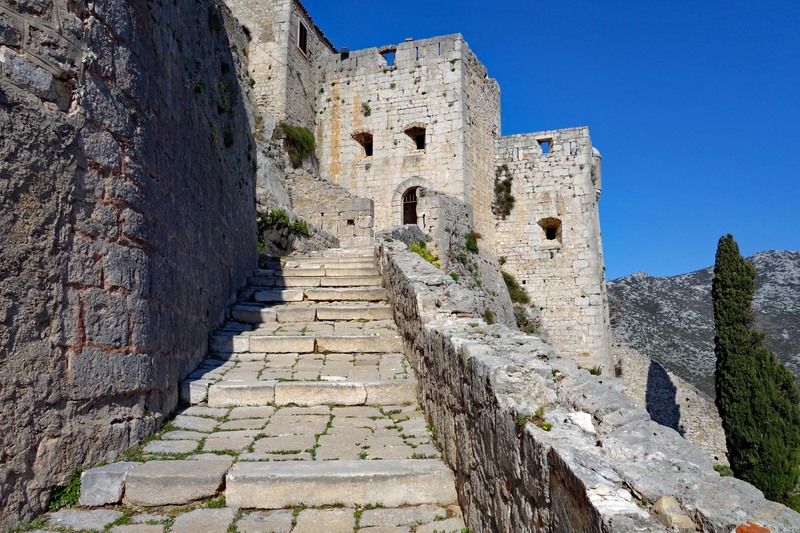 Game of Thrones fans will recognize the fortress as the slave city of Meereen, there is a room with stills from the show to jog your memory if you cannot visualize it. 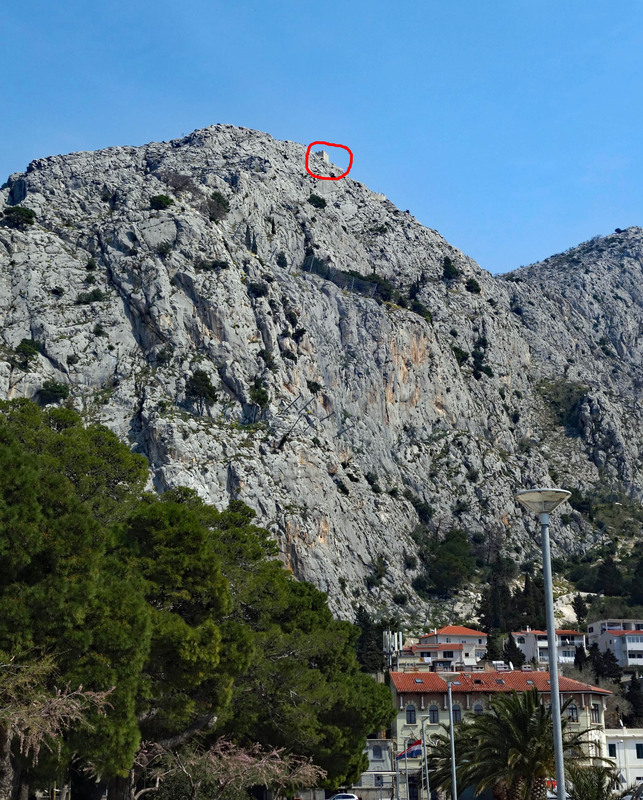 Klis is located 12 km from Spit and can be reached by a 35 min ride on Bus #22. Return bus tickets for us both cost 44 Kuna (6.77 USD). 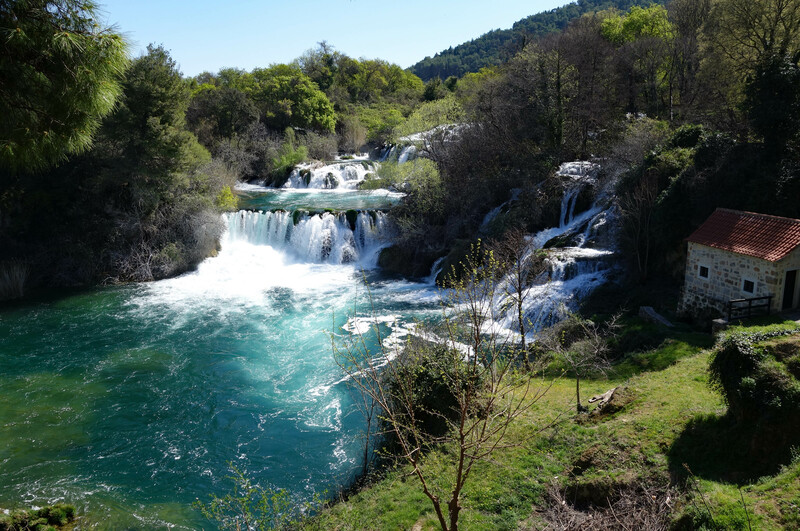 Krka National Park is a 90 min bus ride from Split and where the Skradinski Buk waterfalls are located, they are one of Croatia’s most famous sights. We timed our trip to go there before April 1st when the price increased. Until March 31st the entrance fee is 30 Kuna each (4.62 USD), on April 1st it increases to 100 Kuna (15.40 USD) and in July/August the ticket cost is 200 Kuna each (30.80 USD) so definitely worth our while to get there before the end of March. We purchased return bus tickets online to the town of Skradin, for 113 Kuna each (17.40 USD) leaving Split at 8:00 am…yikes I have not set an alarm in ages 🙂 When we arrived in Skradin we went to the tourist information office and soon found out why the park entrance price was so inexpensive…the boat is not running this time of year to take you to the waterfalls!!! This meant we had a 4 km hike to reach Skradinski buk before walking the 2 km trail around the waterfalls. Not a problem, I was just looking forward to a nice boat ride up the river to the park entrance rather than a 4 km walk on a dusty road. That being said, the views on the walk were spectacular. The color of the water reminded us of lakes in Banff National Park, close to where we grew up. Being off season the park was very quiet, I would guess we saw no more than 250 people which is a far cry from the 10,000 visitors per day they get in high season. 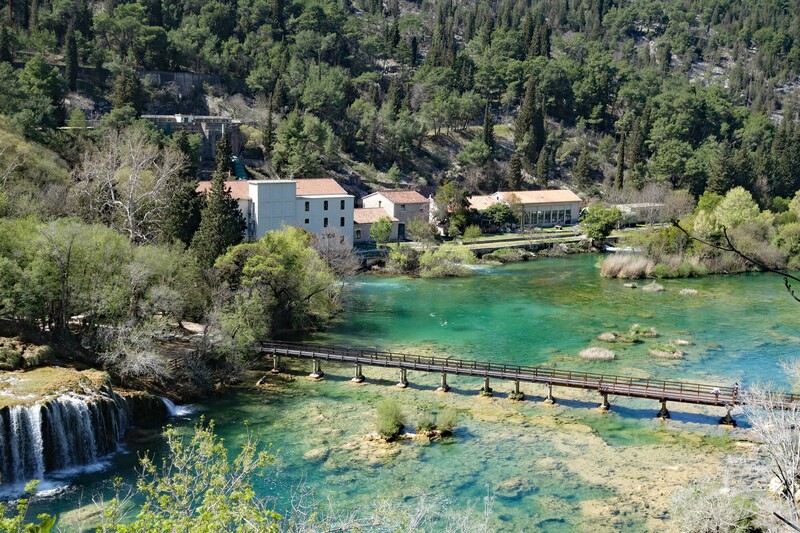 There is no way I would want to be here then 🙁 so if you are planning to visit Krka National Park and the Skradinski buk waterfalls, come in the off season. 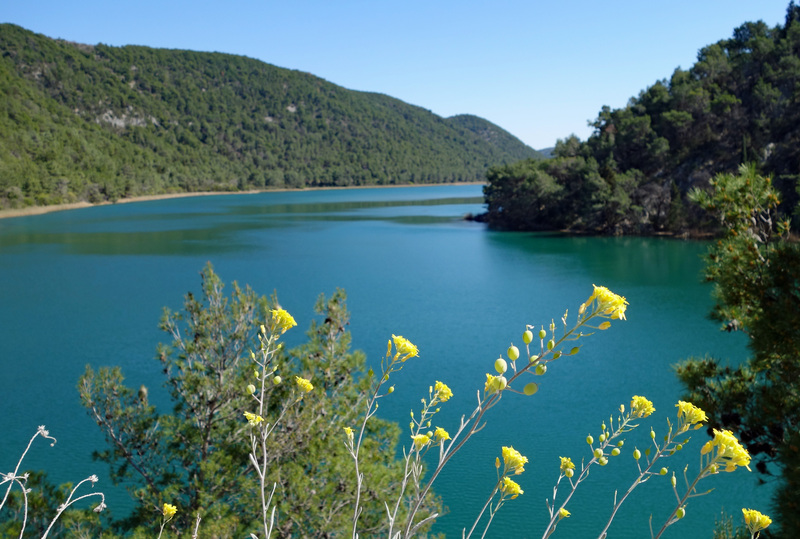 After lunch we trekked the 4 km back to Skradin to catch the bus, while waiting we met some lovely ladies from Porto. We had a nice chat with them about their country and hometown, telling them how much we enjoyed our time in Portugal. 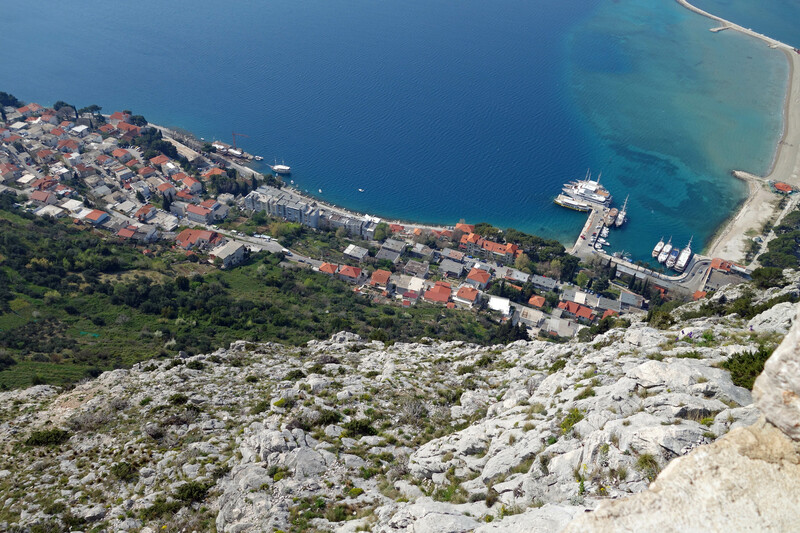 Omis is a seaside town just 25km south of Split and lies at the base of the Dinara Mountain. 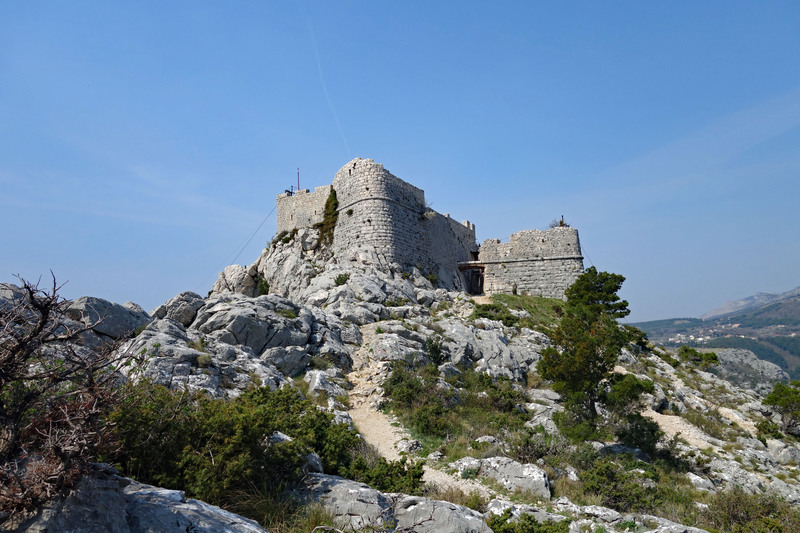 On the top of this mountain sat our destination, the Starigrad Fortress. We purchased return bus tickets from Split to Omis for 40 Kuna each (6.15 USD) and enjoyed the 40 minute ride along the pretty coastal road. Getting off the bus we gazed skyward and saw our destination off in the distance, what have we gotten ourselves into!!! The “trail” and I use this term loosely, started off behind the fire station with a short walk along the road before the stairs began. After we ran out of stairs we were on a rocky pathway climbing quickly upwards. Halfway up the mountain the pathway turned into large rocks which we had to scramble up. Fortunately this was only a short section, but there was more to come before reaching the top. The “trail” up the mountain, can you see the markers? A few thoughts came to my mind on the way up: what are we doing? are we crazy? we are too old for this! where is the pathway? ooohhh going down is going to hurt! Blair’s only comment was it’s a long way down for beer and groceries every day!! 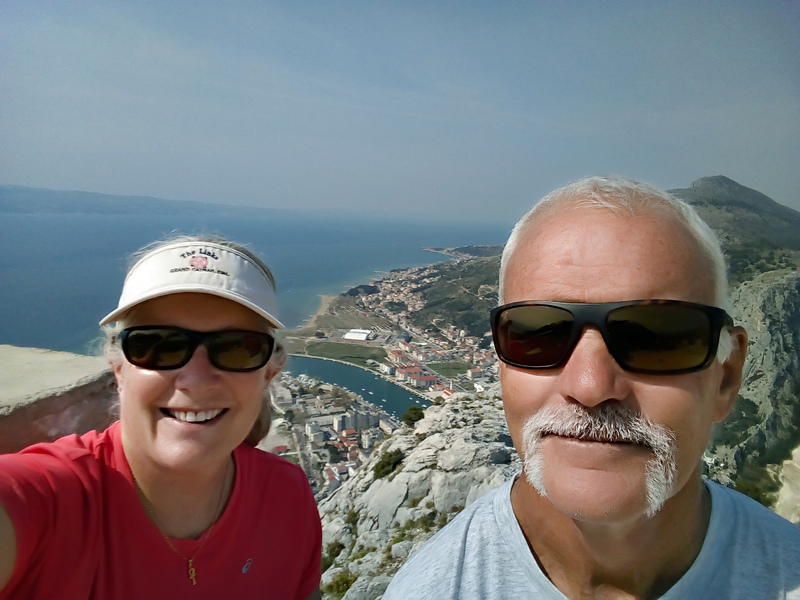 Despite my misgivings, and not so good knees, we took it slowly and after 55 minutes reached the Starigrad Fortress, feeling victorious we made it. Had we rented a car I have no doubt we would have explored the Croatian countryside a lot more. 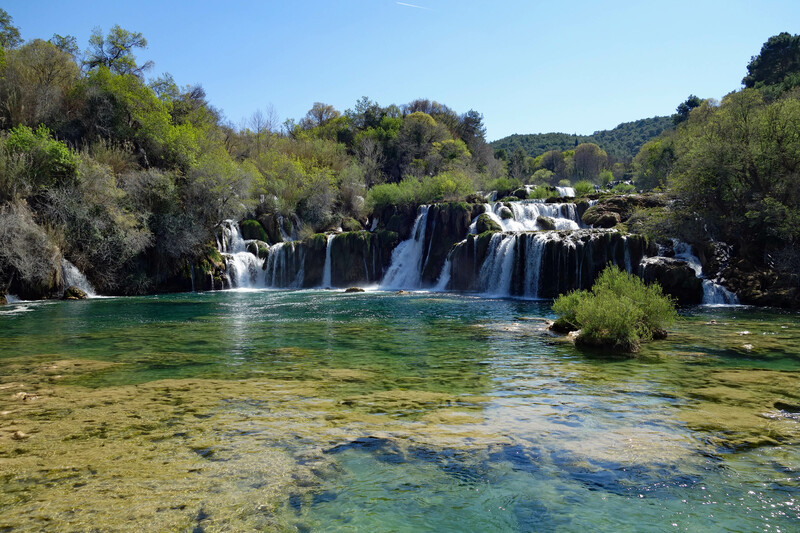 Getting out of the city appeals to us more than city sights and next time we visit Croatia we will endeavor to see more of the country. We have spoken to other travelers who have driven around Croatia and they said it was easy and no problem. We booked our Croatia bus tickets on getbybus.com at this link Seniors discounts start at age 60 so we received a small discount on our ticket prices. Wow…gorgeous views from the top! I commend you for the climb up…..because…I sure wouldn’t have done it since…………I am afraid of heights! Blair’s beer must have tasted amazing….lol. The weather looks gorgeous. Good advice about when to travel and to rent a car.